House of Evidence. There are many persons that think that they could finish their job better when they work alone. They don’t like no one to interrupt them or tell them what to do. On the other hand, there are persons like Jason, Mary and Laura who are detectives that like to work in a team. They feel that this way is better because many people could give many different opinions and find the truth about something faster than a single person. This time Jason, Mary and Laura are in one luxurious weekend house that belongs to one of the richest people in the country. Someone has stolen a lot of valuable pieces of art from this house, a lot of artistic paintings and no one could guess who has done that. The three detectives like to find out who stands behind this crime and find the valuable objects because that could cost a lot on the black market but on the other hand, they could end up to some person that doesn’t realize their value at all. The search will start right away because those three don’t like spending time just like that. They will collect the evidences and try to connect the traces that will lead them to the one, or the ones, that is responsible for the robbery. They surely know their job very well, but detectives could always use some help so could you please help them collect the evidences and get closer to the profile of the criminal?! 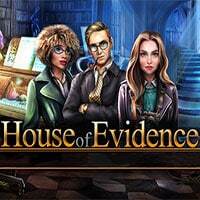 House of Evidence is a free online hidden clues game on Hidden4Fun.